Under the headline â€Journals under Threat: A Joint Response from HSTM Editorsâ€ the editors of some of the leading international journals for history and philosophy of science and social studies of science have issued a joint declaration that I received by email and that I am reprinting here to give it a larger audience. a prosaic quotation from the recent Nature correspondence section that highlights why genetics has been leading us into nowhere. Our lives are unrepeatble experiments lacking a control. Myriad external factors interact with genetic and epigenetic factors and with chance to determine whether we are well or ill, smart or dull, successes or failures. The scale and complexity of today’s biomedical research problems demand that scientists move beyond the confines of their individual disciplines and explore new organizational models for team science. Advances in molecular imaging, for example, require collaborations among diverse groupsâ€”radiologists, cell biologists, physicists, and computer programmers. which sounds great like all interdisciplinary science but has also all the drawbacks (“to temper the wind to the shorn lamb” seems to be the English translation of the German “weakest ring of the chain”). Progress is driven by new scientific questions, which demand new ways of thinking. You want to go where a question takes you, not where your training left you. and not EU accountants drive progress. 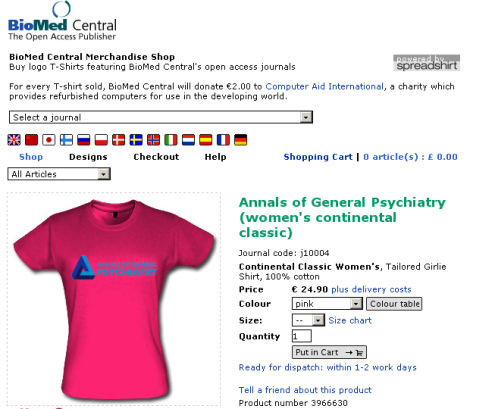 (in US dollars) asks Pimm – the partial immortalization blog. A first response to this question -based on Google adsense revenues- is about $0.47/post. I think that prices depend on context – from negative balance (wasted time) to a new research direction (+tenure +$100,000) there is everything possible. As reported at the Stanford Center for Internet and Society, Shloss v. Estate of James Joyce has settled. As you can read in the settlement agreement, we got everything we were asking for, and more (the rights to republish the book). This is an important victory for a very strong soul, Carol Shloss, and for others in her field. Historically, the word “epigenetics” was used to describe events that could not be explained by genetic principles. Also outside the genetics community many people wonder why Popper’s account of falsifiability has so readily be abandoned. Karl Popper used falsification in “Logic of Scientific Discovery” as a criterion of demarcation between what is and what is not genuinely scientific. Paul K. Feyerabend, one of Poppers many famous scholars at the London School of Economics- defended in “Against Method” (Feyerabend 1993) the view that there are no methodological rules which can be always used by scientists. He objected to any single prescriptive scientific method (like falsification) as any such method would limit the activities of scientists, and restrict scientific progress. Progress instead occurs where new theories are not consistent with older theories; a new theory also can never be consistent with all relevant facts: this make falsification attempts useless. Feyerabend advocated in a rather anarchistic view that scientific pluralism improves the critical power of science and not any schematic rules like profile population x with SNP panel y and describe all p less than z to finally develop new treatment t.
Many reasons why genetic association studies failed have been already identified (see Buchanan et al. 2006). Usually high impact journals get spectacular claims first; half-way down between Popper and Feyerabend, the editorial board looks for falsifiability by claiming additional populations. As expected, effect sizes will not be exactly the same in different populations; often only neighbouring SNP “rescue” the initial claim. It has never been decided by a formal process, what does it mean if a third or fourth population doesn’t show up with the same result. It has never been clarified that falsifiability means that the exactly same SNP needs to be associated in all population studies or just a haplotype (or just a microsatellite allele) somewhere in that genomic region. Nevertheless replication validity – in the context of generalization – is permanently used to prove “true” or “meaningful” association that ultimately deserve a high impact factor. Humans look different and they seem different in genetic terms: the high individual variablity in expressing a disease trait may reflect not only reflect a highly variable environment but also highly individual genetic pathway. We are willing to accept a causal mutation found in just one family with a monogenic trait often there seems no way to convince an editorial board that a strong association found in just one study sample is an important discovery that may severely impact exactly this population (given additional functional proof of otherwise static gene variant). The absence of large linkage signals and the absence of reproducible genetic associations with nearly all complex diseases may indicate only individual risk gene combinations. It seems to be that we need to listen to another scholar of Popper – Thomas Kuhn — to change the current paradigma. I have recently read about a round-table discussion on “so called experts” – a frequent topic in environmental circles. Have to say that I do not fear so much half-way baked knowledge – even renowned experts are occasionally slipping to a closely related field where they are no expert at all. Or do you believe that a Nobel prize winner in physics has any primacy in ethics? In the same vein, there is comment in nature medicine about Wikipedia – complaining that a 4th year medical student (“who is barely old enough to buy beer”) has such a large influence on medical writing at Wikipedia. As there doesnÂ´t follow any details of his major errors or misunderstandings, I conclude that this comment is more about the beer drinking habits of the author Brandom Keim. Anyway, there are quite interesting new sites by medical doctors like Gantyd (“get a note from your doctor”, so far 3000 topic pages, 200 editors from 6 countries) or Ask Dr. Wiki (4 editors, clinical notes, pearls, ECGs, X-ray images and coronary angiograms) all worth a look. Sometimes erroneously described as global village phenomenon the notion of a small world goes back to an experiment by Stanley Milgram (who became famous with the “obedience to authority” experiment – I did not know until last weeks that the punishing experiments had been repeated here in Munich where 85 percent of the subjects continued until to the end!). The small world theory says that everyone in the world can be reached through a short chain of social acquaintances. The concept gave rise to the famous phrase of phrase six degrees of separation – I believe that a scientist may even reach another scientist in 4-5 steps. 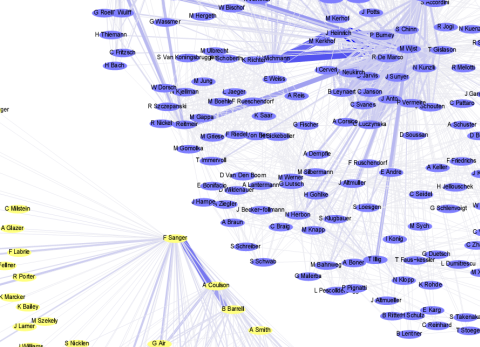 My first PubNet example here is to reach F. Sanger by joint co-authors. This doesn’t work – my estimate would be 3 intermediary steps. My second PubNet example is to reach N. Morton (the foreword of his anniversary book says that a qualification of a genetic epidemiologist can be counted as “Newton”-points – the number of joint publications with Professor Morton). Arxive.org has the largest study so far: 6,6 steps in 30 billion messenger conversations among 240 million people. NYT today has an interesting article about freebase (no, nothing about cocaine here) a forthcoming sematic web approach. On the Web, there are few rules governing how information should be organized. But in the Metaweb database, to be named Freebase, information will be structured to make it possible for software programs to discern relationships and even meaning. For example, an entry for Californiaâ€™s governor, Arnold Schwarzenegger, would be entered as a topic that would include a variety of attributes or â€œviewsâ€ describing him as an actor, athlete and politician â€” listing them in a highly structured way in the database. That would make it possible for programmers and Web developers to write programs allowing Internet users to pose queries that might produce a simple, useful answer rather than a long list of documents. 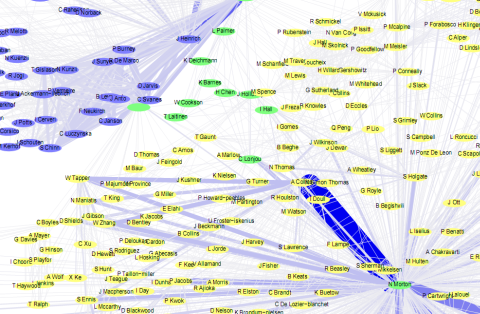 Valleywag – the famous tech gossip – also has something about semantic webs.